It takes more than just a celebrity chef and a few honeymoon suites to make truly memorable hotel. Behind the scenes, there's a world of integrated data, targeted messaging, and technologies that allow guests to customize their experience and actually make it more like home. With feet planted firmly upon the center of metropolitan Grand Rapids, a gust of fresh air through the hotel's vibrant, sky-lit corridor is enough to carry your mindset thousands miles away. For those enjoying one of Chef Todd Webb's culinary creations at six.one.six, or a smart cocktail at Mixology, the Grand River becomes an elegant backdrop for some of the most modern dining and overnight experiences found in the city. The same ticket to a luxurious escape can be found down the street at the Amway Grand Plaza Hotel, and many other hotels and restaurants that have become synonymous with the name Grand Rapids, as they innovate the limits of our city's hospitality industry and add character to its skyline. It takes more than just a celebrity chef and a few honeymoon suites to make truly memorable hotel. Behind the scenes, there's a world of integrated data, targeted messaging, and technologies that allow guests to customize their experience and actually make it more like home. It's more than just free WiFi, air-conditioning, and HBO. Smart phone technologies are being integrated with new responsive devices, connecting everything from room doors, to entertainment systems, to meeting and work spaces, to messaging on special offers. Within this 'technosystem,' Marriott's own Internet of Things, anyone using the hotel's app, for example, can reserve a room, find parking, take advantage of limited offers triggered by localized beacons, and access a myriad of other actionable options on the digital horizon. According to Grand Rapid native and JW Marriott General Manager Brian Behler, the beauty of the whole system is how seamlessly it merges with existing technologies, combining the enjoyment of a luxury hotel with priceless personal touches. That familiarity is emphasized with each iteration and update. "When I sit down with our leadership team and our IT team, I’m thinking about how we can make this more like home. It’s still a special place. Our guests are here to celebrate or just getaway," Behler says. "Whether it’s a family trip, business trip, or convention; whatever their reason is, I'm asking how we can make them feel as comfortable about their experience as possible. It has to do with this device," Behler continues, brandishing his iPhone. "Everybody is attached at their fingertips, so now how do we take this mobile app and make it more dynamic?" Smartphones are used in a number of different ways, from guest alerts to streaming media to room screens, to a replacement to the room key. Part of that evolving process is determining how to best welcome guests to the JW Marriott through a personalized onboarding system. Beacon technology, in the form of data transmission points throughout the hotel, have been set up at the JW for several months now, gathering data to help fine tune the system before the May rollout. Syncing that usage data with reservation information, the hotel has been able to target individuals and groups that book rooms at the JW Marriott with relevant deals and details. "If you’re here for the Grand Rapids Student Advancement Foundation's MindShare, it would ping your phone with a ‘Welcome to the JW for Mind Share! We’re so excited to have you!’" Behler says. "Along with other simple things like integrating your phone with our parking system. That’s what we’re doing, going into the summer, to customize our technology." Hotels under the AHC+Hospitality management umbrella, the former Amway Hotel Corporation, which has expanded to include the JW Marriott, Downtown Courtyard by Marriott, and Peter Island Resort & Spa in the British Virgin Islands, as well as the Grand Plaza, are focused on surpassing the expectations of guests' technology needs, says Josh Serba, Chief Information Officer for AHC+Hospitality. Serba admits there is no shortage of challenges when it comes to integrating property management systems into client-facing technologies, and that staying ahead of the technology curve in general can be difficult in the hospitality industry. A significant amount of money invested into the latest IoT innovations is hoped to help overcome those challenges, by providing guests more insight into the benefits of staying at these hotels. Every room now supports streaming media from guests. "Reservations, check-in, and several other mobile applications can be utilized to speed up the arrival/departure process. Hotel franchises like Hilton, Marriott, etc. offer this functionality within their mobile app, which is quickly becoming the standard everywhere," Serba says. "Today's guests prefer to spend less time at the front desk and more time finding entertainment." At the Amway Grand Plaza, at least, plans for entertainment and other amenities can be put together about 15 feet past the valet station, where a large touch screen display directs visitors to special event, dining, and spa schedules within the hotel, as well as relevant attractions downtown. The heavy lifting of digital marketing for many hotels is focused on landing reservations, but where technology plays a part in enhancing the overall stay is evident throughout the engagement. At the JW Marriott, each area of interest provides a different look at how the hotel interacts with guests. From food and beverages, to entertainment, to business and digital access, to the comforts of home; after someone has booked a room and arrives in downtown Grand Rapids, the staff and systems of the JW Marriott work to enhance the experience at every level. Using Digital Alchemy, a customer relationship management platform based on the needs of the hospitality industry, AHC+ properties, those that have booked rooms in a Marriott hotel or the Grand Plaza will be connected to the hotel's marketing reach and insights from the moment their request is submitted. But that doesn't mean the amenities are restricted to those planning an overnight stay. Working with Steelcase, one of West Michigan's most innovative and well-known names in office environments, the JW Marriott's "mediascapes" provide a satellite business center for conference and business meeting attendees, as well as any other guests that may need to plug in or log on. "Even though we are just 10 years old, it’s incredible how quickly we have changed," Behler says. "We have an amazing partnership with Steelcase, allowing people to just plug in and play or have little mini meetings within our public spaces. And we make sure we have outlets in all the right spaces when we’re installing something. When we put in the new couches in the lobby, for example, we put outlets along all of them. Everybody is connected, and that means they need to recharge." The Marriott recently expanded its WiFi coverage by 300 percent, which not only benefits guests at the hotel, but also provides a stable platform for location-based offers within the property, Serba says. "In this new IoT world we are in, everything you see is somehow connected. 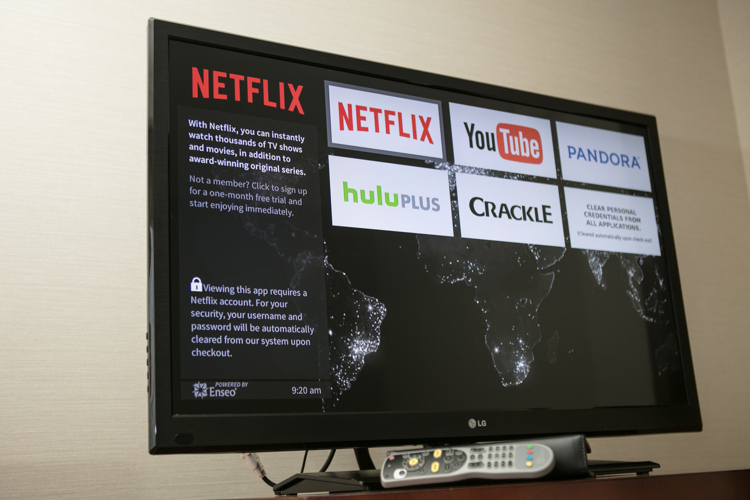 Whether you are walking through the lobby viewing digital signage, or streaming your Netflix account in the room to the TV, the rate of change is rapid," he says. "Hotels that offer these services are chosen over those that do not. With the added coverage, we will soon have the ability to offer notifications to our guests based on their location with an ultimate goal of driving up sales to our restaurants and outlets." Mobile devices are not only helping to enhance the experience offered by hotels; they’re being used in both the front and back of the house in various restaurants all around the world. In Grand Rapids, it’s easy enough to narrow down one’s options by a simple Internet search, or even asking a digital assistant. But depending on where you wind up, handheld technology may play a role in the dining room and kitchen, too. Jeremy Paquin, head chef at Grove, the Essence Group’s Cherry Street farm-to-table restaurant, says smartphones are a tremendous asset in the food preparation process. OpenTable software makes the reservation and seating process nearly seamless for those who use the mobile app, and it helps servers notate orders and alert the kitchen staff to anything from first-time guests, to food allergies, to special occasions. And in the kitchen, the limits of molecular biology are tested with techniques that allow Paquin and his team to experiment with gels, foams, and other altered states of tastemaking. While he was raised in Texas, Paquin says he started cooking at the age of 11, spending summers at his grandmother's restaurant in Michigan’s Upper Peninsula until he was 14. “Her restaurant was my first cooking experience and my most cherished,” he says. Since then, having run a restaurant with his wife for eight years and relocating to West Michigan, Paquin says his passion for cooking has only grown as he’s honed his skills and developed new ones. I pull inspirations from other chefs and restaurants, farmers and their dedication, and I also find inspiration from other talented chefs I've had the pleasure of working with,” Paquin says. For the Essence Group, that means constantly evolving and trying new things, “whether it be in cutting edge cooking or using new technology to ensure our guests have an exceptional experience,” he says. That unique environment not only shines through in the popularity of restaurants like Grove, Bistro Bella Vita, and the Green Well Gastro Pub, but in the wealth of innovative and alluring dining opportunities throughout the rest of the region. You don’t need to be a Yelp reviewer to understand the impact technology has on today’s restaurant scene, of course. A simple grasp of Google Maps will get you there and the host will promptly and politely explain the rest. They don’t call it hospitality for nothing. 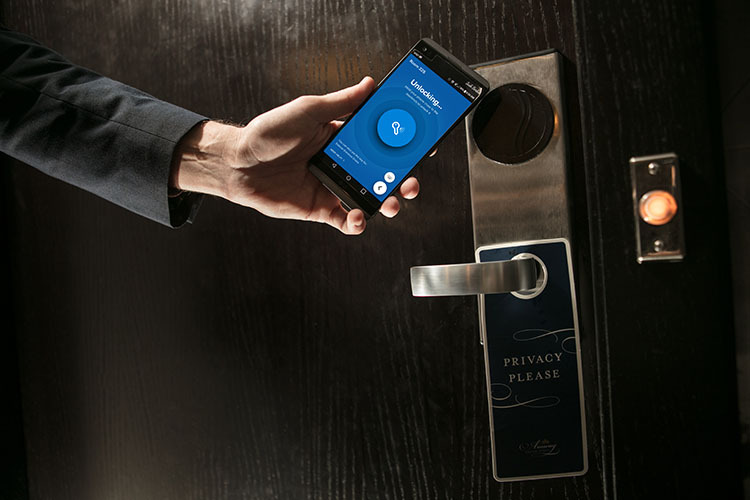 One of the newest features AHC+Hospitality has implemented in its hotels are digital keys, allowing guests to check in, enter, and lock their room doors from a smartphone, without ever having to stop at the front desk. Already in place at the Amway Grand Plaza, digital keys will be installed at the JW Marriott next year. "It’s going to be a very large investment because we have to change all of our locks throughout the hotel, which makes the whole door look different," Behler says. Each room has a remote for the TV that will also operate Netflix. 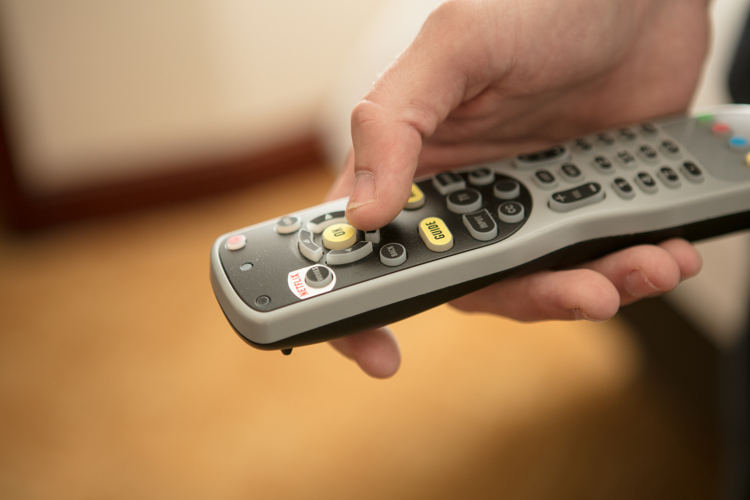 And within each room, a partnership with Enseo, a media company based in Texas, gives them access to their personal video or audio streaming services, which will only continue to grow as TV providers expand their programming on mobile devices, Serba says. "Enseo was a huge upgrade for us," Behler affirms. "We were one of the first JWs to put that system in, which is basically smart TV. Utilizing this little black box that’s attached to the back of a TV, you can then do your Netflix, Hulu, and Pandora. That all happened about a year and a half ago, which just enhances the guest experience because it’s something we can do at home." The point of sales systems within the hotel are soon to be replaced with mobile responsive technology as well. From Starbucks, to the jdek, each cashier station will be updated with equipment and software running on the Oracle POS platform, integrating with the hotel's existing technology infrastructure. The questions we're always asking is, how do we make it more streamlined? How do we make it more efficient? How do we allow the guest to have it at their fingertips?" Behler says. If it is an electronic device that guests are using to pay with by transmitting sensitive account numbers, Payment Card Industry compliance plays a major role in developing those systems. And from an IT perspective, Serba says, one of the biggest challenges comes from finding a window to perform upgrades and maintenance. "Given the fact that we never close, it makes it difficult to implement new systems because guests are always using our infrastructure," the CIO maintains. "The other challenge is finding the right technology that serves the majority of our guests’ needs. With such a variety of demographics, offering state of the art technology is great, but we often need to ensure that some of the commonly-used traditional systems are still available." As impressive as AHC+Hospitality's client-facing technologies are, the innovations that have gone into powering and maintaining Grand Rapids' most popular hotels may have even more impact. While its interior may sing out in flashy hues of orange and blue, Behler says the JW Marriott, in its 10 years of existence, has taken a green approach to new construction, using energy efficient devices wherever possible. "I helped open the JW and celebrated my tenth anniversary in February," says Behler, a graduate of Davenport University and former regional director of Trans Inn Management. "We opened in September, 2007 and were a pretty hip and trendy hotel at that point. We want to stay there, and finding the latest and greatest from an engineering standpoint, or working with businesses like Steelcase, will help us do that." Using groundwater instead of city water for the hotel's cooling towers helps save money and conserve natural resources, while energy efficient lighting and other low power draw devices increase efficiency. The JW's lead engineer, Dan Pierson, was a featured panel speaker at the 2017 Battle of the Buildings, held April 19. The competition recognizes the leaders in energy-efficient building practices, and is organized by the West Michigan chapter of the U.S. Green Buildings Council. Pierson's recognition, and the opportunity for the JW Marriott to host the event, are a testament to the hotel's commitment to environmental awareness, Behler says. With partners like Steelcase, it's no difficulty for AHC+ properties to find suppliers of energy efficient materials and game-changing design, and as part of a global network of hotels, the same connections to the latest in building and interconnected technologies are not hard to come by, either. "Some of it is research and development that Marriott does that we can help pilot and test. Typically, they are always reaching out with any new product testing opportunity, to top performing hotels," Behler says. "I always have my hand up for something new." Serba brings back ideas from conferences, trade shows, and affiliate hotels all over the country. Most recently, visiting the Marriott's $57 million tech center in Denver, he relayed several ideas back to Behler that may some day soon see the light of full production. He admits it can lead to a lot of IT issues in a very short time, but the excitement of finding methods to build off existing technologies, and integrating new systems into them is hard to match. "I have an amazing team and I look forward to every day, as it's a new opportunity to learn and apply something new for our staff and guests," Serba says. Those new ideas are in high demand, too. As Forbes reported earlier in April, both guests and hotel managers are seeking out new ways of using technology to interact with this $500 billion global industry, from facial recognition and voice-activated software, to virtual reality, and even artificial intelligence. More efficient and environmentally-conscious ways of constructing, powering, and operating hotels are being tested all over the world, as well, with some of the more interesting stories coming out of Asia. The "Henna (Weird) Hotel," as Japan Today detailed in March 2016, has been running on Toshiba's H2One hydrogen energy supply for over a year now. The solar power generator and hydrogen production system work together to create a truly renewable, stable energy supply for the hotel. It's almost an afterthought that the Henna is staffed by robots. According to the 2017 travel and hospitality industry outlook by the Deloitte Center for Industry Insights, global business travel expenditures have reached a new high in recent years, topping $1.2 trillion in 2015 alone. And while digital kiosks may be the most important improvement to the airport since in-flight WiFi, the most successful hotels, based on user feedback, combine the latest technologies with old fashioned, IRL, face-to-face, human contact. That insight hasn't been lost on the hotels of AHC+Hospitality, where personal interaction still provides the foundation for their business, as it has for the JW Marriott for a decade and the Grand Plaza for nearly four times that. "We are somewhat unique in our industry because of the service we provide to our guests. While most hotel management companies funnel their calls to a third party service who tend to have less on-site presence, we handle our guest requests with a personal touch. We visit the room and provide IT support in person," Serba says. "In doing so, we hear directly what they want from their technology. This level of service, combined with properly functioning systems, sets AHC+Hospitality apart from others." The next few years will undoubtedly see the hospitality industry integrating with even more impressive technologies as existing innovations shrink in cost and physical dimensions. The technology involved in today's seemingly invisible Internet of Things sensors were once much bulkier iterations, but understanding their importance to the interconnected world of the future, computer scientists have succeeded in creating discrete devices applicable to mass market. The same story follows the technology in use at hotels and restaurants throughout West Michigan. It may be some time before the Grand River ever sees its own underwater hotel, or even robot concierge, but the future is just around the corner, and for those expecting to make a reservation this year, the evidence is at your fingertips. Just make sure you remember your passport. This is part of a 12-article series highlighting the technological innovators and drivers in West Michigan. To see previous articles in this series, please go here. With this series, Rapid Growth will delve into the question: What are businesses and organizations doing to leverage technological advances to create an impact within our region, and what are the stories behind these agents of sweeping change in our society? This series is funded by Open Systems Technologies (OST), a Grand Rapids-based information technology leader that is delivering enterprise level solutions around the globe. Matthew Russell, the editor of this series, is a writer, baker, inventor and mapmaker living in Grand Rapids. He enjoys bicycling and playing with his daughter as much as possible. You can email him at m.s.russell@gmail.com, or follow him on Facebook and Twitter.